If you find yourself in Northern Virginia or areas like Springfield, Vienna, Reston, McLean, Great Falls, Loudoun, Falls Church, Alexandria, Fairfax, Arlington, or Ashburn, we want to tell you about our award-winning tree care company, Growing Earth Tree Care. We’ve been part of the North Virginia community, being experienced and knowledgeable tree care specialists, for over forty years now. We are comprised of a team of certified arborists who have a passion for serving residential and commercial clients alike, big or small. We have a range of tree care services that we are happy to provide. Whether you are looking for an emergency tree removal or for a pest control solution, we have the knowledge of the regional environment and the friendly customer service that sets us apart as a tree doctor company, if you’ll allow such an expression. Our other services include tree and stump removal, tree pruning, tree disease treatment and diagnosis, soil and root care, along with general tree maintenance. We can pretty much do it all when it comes to taking care of trees, so there’s really only one choice when you are looking for an insured professional tree care company. We should probably stop bragging (sorry, we can’t help ourselves) about how great we are as a tree company, but keep in mind we just want people to know how much we care about the trees in our community! 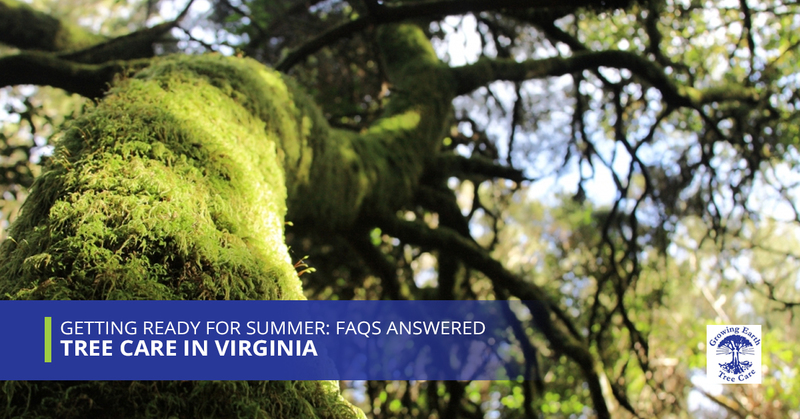 Today’s post is going to to highlight a few of the more common customer questions we hear, specifically related to summer tree care in Virginia. Without further ado, let’s get started so you can start thinking about how much better your yard would look with vibrant, healthy trees. Where Do I Start With Summer Tree Care? Start with the landscape of your yard. While we aren’t lawn care specialists by any means, we do understand the interaction between your lawn and trees. While you are getting a feel for how you want to clean up or alter your yard to get prepared for barbecues or what have you, make sure that you take a look up at the trees in your yard. You want to be looking out for any limbs that look like they might fall soon, along with looking for any potential pest control issues. We will get to pest control a bit later, but remember to look up and around while you are getting a feel for your summer yard. What Does Good Soil Care Look Like Beyond Watering? Making sure you water your trees and lawn when it hasn’t rained for a while is a good start, but it’s far from comprehensive soil care. In fact, a high percentage of tree problems originate with poor soil and root conditions, which eventually translate to the entire organism. Common problems can include the quotient of acidity in the soil, soil compaction, planting depth, along with a host of other issues. While we want to encourage our readers to nip this in the bud, many times we see this issue long after we would prefer, which means it usually requires our professional care to truly solve. We typically employ methods likes root pruning and mulching, among other advanced solutions. We mentioned mulching earlier, and for good reason. Mulching is a vital component to your trees’ health (especially young trees) because of the positive impact it will have on the surrounding soil. Namely, mulching will normalize soil temperature, hold in moisture, and reduce the existence of weeds. All of those are important to regulate soil conditions, which in turn will afford a greater likelihood of long-term health for your tree. What Does Good Watering Look Like? Well, like anything, it depends. In our Virginia climate, we get a reasonable amount of rainfall every year, so unless we are in a drought, you are looking to have around an inch of water for your trees each week. Our main tip here is to water thoroughly and deeply rather than sporadically and lightly. This can be counter-intuitive to some, but the concept of “drowning” your plants doesn’t really apply as much to trees. So give them a deep soak! Should I Treat My Little, Younger Trees Any Differently Than The Older Trees? As trees develop, they usually become stronger and stiffen against the elements. But younger trees aren’t able to handle the at times harsh winters that we experience around here, what with the freezing and thawing and back again, on almost a daily basis. So what can be done? Let’s talk about mulching, again. For the little trees, you’re going to want to lay down a thick layer of mulch all around the base of your tree. Be sure to not put the layer, up to six inches deep, flush against the trunk, because that can trap moisture which leads to fungus growth, which isn’t going to be good for anyone. Either bark chips or leaves will work well for this. Another solution to this issue is to wrap the tree trunk up in burlap or a similar material, which has the same net effect. It’s like swaddling a cold baby. How Do I Know Which Limbs To Prune? We are tree pruning specialists, so remember that if you don’t have the time or resources to prune your branches, we would be more than happy to set up a free consultation with you so we can give you a quote. But if you feel up to the task, that’s great! We are going to help set you up for success. You want to remember to remove the “3 Ds of pruning”: diseased, dead, or damaged. While you always want to use caution, it’s important to remove these branches because that is how pests or diseases can find their way inside the tree. Plus, your tree will look healthier, which is always nice. What Should I Know About Tree Pest Control And Tree Disease Treatment? Okay, very few people have phrased the question this this precise way, but tree disease and pest control are interrelated. When it comes to tree disease diagnosis, the first step is to analyze the situation. During your initial walk through every late spring, you will want to check each tree out for pest issues. You’ll want to continue to do this intermittently throughout the summer as well. You want to look out for spider mites, magnolia scale, aphids, and other nasty little guys, which can create a problem. In truth, not all tree pests will lead to tree disease, so it’s important to have a trained eye assess the situation once you have identified that there might be a pest control issue. Our certified arborists are experienced and are straight-shooters. They will tell you the exact steps needed to be taken to get your trees in tip-top shape! Whether you are looking at tree removal, tree pruning, pest control, or some other form of tree maintenance altogether, Growing Earth Tree Care is an option worth considering. We are successful and happy when we help our customer’s trees grow and look beautiful. With an A+ rating on the BBB and our affordable pricing, it makes sense to get a free estimate from your local tree care specialists. Get in touch with us today!